Attending Oxford’s Merlin College was all that Graham “Gray” Marshall wanted out of life. He got it, at the expense of his family, and he’s not one to squander his good luck. Unfortunately, good luck doesn’t always follow Gray around, and when he becomes embroiled in a mysterious midnight errand with others from school, an errand that goes beyond horribly wrong, Gray is whisked away to his professor’s country home for the long vacation (aka summer break). But to what extent? Gray can’t help but feel like a prisoner, and based on some odd goings on before he left school, he’s pretty sure his professor does not have his best interests at heart. But without any evidence and only his gut feeling to go on, Gray is stuck. While being forced into servitude during his exile, Gray meets the professor’s three daughters, most notably, Sophie. Sophie, despite having been tested for magic and found lacking, has always been fascinated with it. So when she first meets Gray, she can’t wait to learn more about him and what he knows. As they become acquainted, they begin to uncover secrets thought buried, and conspiracies that lead all the way up to the King himself. In order to keep the Kingdom out of catastrophe, Gray and Sophie will have to escape from the Professor’s watchful eye back to where it all started: Oxford. I’m really starting to love historicals that feature fantastical elements. Sylvia Izzo Hunter does a great job of creating an alternate Britain—with varying magical/religious beliefs—without having the “new history” and what is true history get too confusing, as I’ve encountered a few times when authors decide to put a spin on historical facts. For all that I really liked the concept of The Midnight Queen, I felt like there were a few things lacking. For example, I wanted to know more about Merlin College. I love magical school stories (thank you, Harry Potter) and I felt there was a lot of emphasis put on the college, yet we’re rarely there within the story. Also, while I found the conflict of the story to be intriguing—what with unraveling conspiracies and everything—there were a few too many scenes of waiting. I felt like once the information was known by the characters, there was nothing left to learn and the time between when everything is figured out and when they could act seemed to go on and on. Where the story truly excelled was with Sophie and Gray. Their budding relationship is one I’d happily call sweet, in the best possible way. I really loved how the magic manifested when they were together. Gray was one of those heroes who is thought of as just plain. He’s too tall and gangly, and because he lacks certain confidence he stutters. But over the course of the book, his plainness gives way to attractiveness through his actions—especially his actions towards Sophie—and he comes out as the best kind of hero. You almost don’t even remember the way he’s originally described, because it doesn’t matter, you’ve formed your own picture of him in your mind. Even with my qualms, I’m still looking forward to reading the next book. 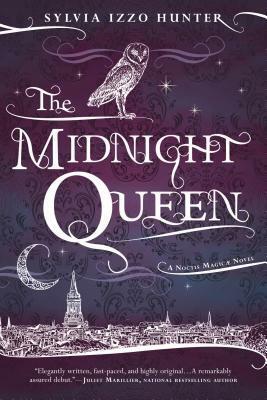 The end of The Midnight Queen hints that, hopefully, we’ll get a closer look at Merlin College and, really, I’m very interested to see what’s next for Sophie and Gray.